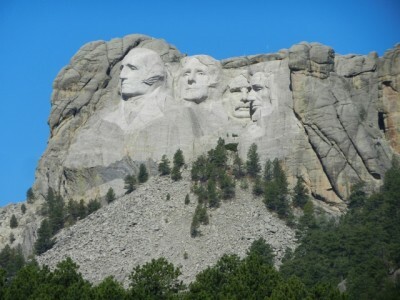 Rapid City, South Dakota on Thursday July 19 was the hottest place in America at 107˚F. 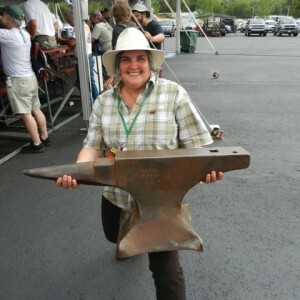 Where else would blacksmiths converge onto black asphalt and light forges? We attended ABANA’s 4 day reunion on the Great Plains and had a wonderful time. 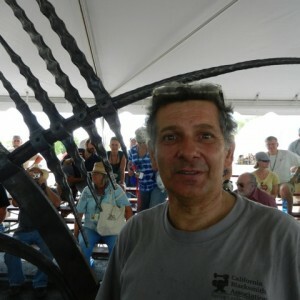 Demonstrators such as world class Italian blacksmith Claudio Bottero made a large modern sculpture which was interesting to see develop. We enjoyed watching the true craftsmanship of the Punzo family from Mexico, making beautiful hammered copper bowls from stripped and melted electrical wire. 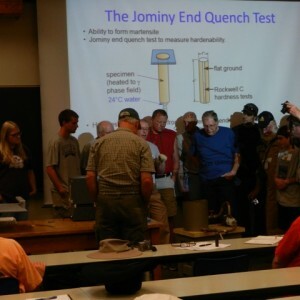 But it was the unexpected delight of events at the nearby South Dakota School of Mines and Technology which impressed us most. 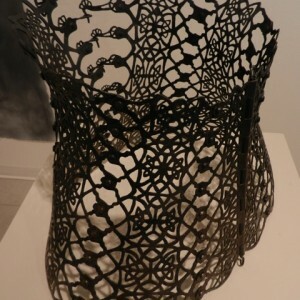 Ellen Durkan from Delaware USA had a slide show and exhibition of amazing lace which she created using a jewellery saw to pierce and hand cut steel and copper. This was forged into a corset, bra, platform shoes and other “Accessories for an Iron Lady”. 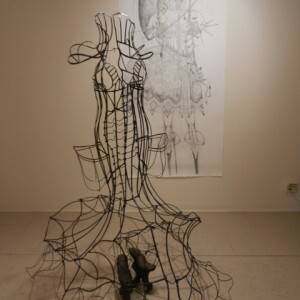 Her charcoal and graphite drawings of steelwork interacting with the female form, together with finished copper and steel costumes were breathtakingly original. Ellen’s high fashion runway blacksmithing gave us an insight into her passion and determination to express her own individuality. Michael West, Head of the Department of Materials and Metallurgical Engineering (one of only seven in the country), gave us a fascinating tour and lecture which included an understandable explanation of the austinite to martensite process when tempering and quenching steel. Back at the conference, demonstrations over several days by Brian Brazeal’s young smiths were entertaining. The whole event was well worth driving two days to experience and we returned to Canada refreshed and invigorated. Thanks to everyone who made it happen. Thanks for the kind words and the picture! The website looks great. I will definitely stay in touch. Thank you so much for the great comments on your website link. I’m forwarding all to our board members. Hi, thanks for coming to the lecture! I’ll keep you posted if I do anything exciting!